Local fishermen have denounced the existence of organized crime groups operating in the Gulf of Mexico, off the shores of Campeche for several months now. In the early morning hours of Saturday April 7, two incidents occurred in Laguna de Términos and one more in the area known as Sonda de Campeche, in all cases, men armed with rifles and ski masks stripped the fishermen of their outboard motors, fishing nets, product, communication radios, cell phones and cash, leaving them in the middle of the sea. The criminals use speedboats to intercept the fishing boats, they strip the fishermen off their belongings, beat them up if they resist and leave them stranded in the middle of the ocean without a motor. “The criminals robbed our nets, catch of the day, radios, cellphones, and even our engine! We were physically attacked and left adrift. We stayed for hours at sea until we were rescued by other fishermen who took us to a safe harbor” explained one of the victims. 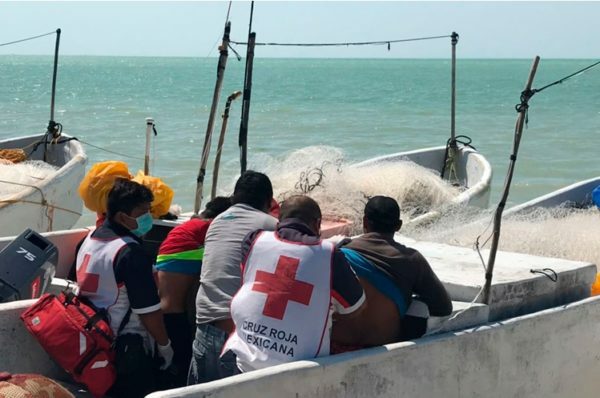 In a second incident, occurred in the area of Laguna de Términos, two fishermen were setting up crab traps, when they were intercepted again by four armed individuals with their faces covered who were also traveling in a speedboat. In this case, the fishermen were stripped of 600 crab traps, their outboard motor, cellphones and communication radios. Mexican Red Cross paramedics reviewed the vicitms’ health, fortunately they were only beaten. Nonetheless, two pregnant women suffered nervous breakdowns when they knew that their husbands had been robbed at high sea. While being checked by paramedics of the Mexican Red Cross one of the victims declared: “We heard gun shots, they came out of nowhere, ripped us off… one of them told the one who had the weapon: “Kill them”, but we begged them not to harm us, so they just beat us up”.